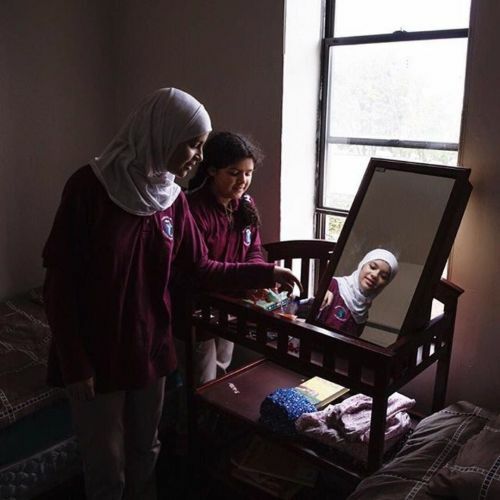 "Nabiha Darbi, left, 13, and her sister, Hajar, 12, in their bedroom in New Jersey. The girls arrived in the United States from Syria at the end of July with their father, mother and 5-year-old brother. They are among 78 Syrian #refugees who have been resettled in the New York metropolitan area since October 2014. Only 1,682 in total have been settled across the U.S. "This is the end of our journey," said their father, Mohamed. "But they have their entire future ahead of them." #regram from @malinfezehai, who photographed the Darbi family and other #Syrian refugees." By nytimes on Instagram.